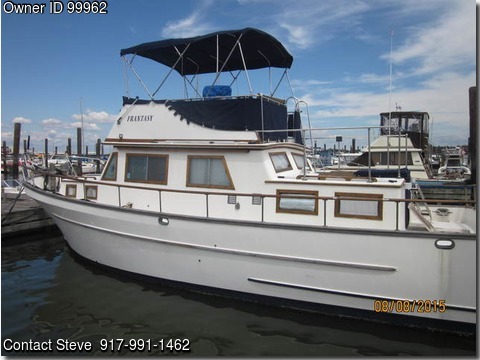 The nicest 1984 Trawler you will ever see. She has a single 135 hp perkins diesel engine that burns 2.5 gallons an hour. Aft cabin has its own head with tub and shower. Forward has two v bunks and seperate head. Main cabin has teak table with seating for 4. Boat is fully air conditioned with reverse cycle heat. The floors throughout the boat are teak and holly, there are duel steering stations. Full fly bridge with an enclosure and can hold 8 people, plenty of storage. My Wife and I are the original owners. Please do not hesitate to call with any questions. 718-275-4832 no texts.